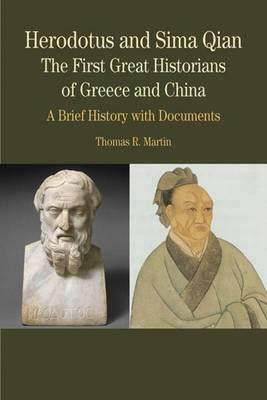 In this accessible volume, Thomas R. Martin compares the writings of Herodotus in ancient Greece with those of Sima Qian in ancient China to demonstrate the hallmarks of early history writing. While these authors lived in different centuries and were not aware of each other's works, Martin shows the similar struggles that each grappled with in preparing their historical accounts and how their efforts helped invent modern notions of history writing and the job of the historian. The introduction's cross-cultural analysis includes a biography of each author, illustrating the setting and times in which he worked, as well as a discussion of how each man introduced interpretation and moral judgment into his writing. The accompanying documents include excerpts from Herodotus' The Histories and Sima Qian's Shiji, which illustrate their approach to history writing and their understanding of their own cultures. PART I: INTRODUCTION: Inventing History Writing in Greece and China.- PART II: THE DOCUMENTS.- Herodotus, The Histories.- How Asia and Europe Became Enemies: The Story of Croesus.- How Others Live: The Customs of the Persians, Egyptians, Massagetai, and Scythians.- Roping Asia to Europe: The Persian Invasion of Greece.- Death before Dishonor: The Battle of Thermopylae and the Story of the Three Hundred.- Human Wisdom and Divine Vengeance: Artemisia's Advice and Hermotimus's Revenge.- Ending Stories: Cruelty and Revenge on Both Sides.- Sima Qian, The Records of the Historian.- Castration as the Price of Writing History: Sima Qian's Autobiographical Letter to Ren An.- The First Emperor of China: The Basic Annals of the Qin Dynasty.- Born from a Dragon: The Origins of Gaozu, founder of the Former Han Dynasty.- A Woman in Power: Empress Lu.- Heroic Hermits: The Biographies of Bo Yi and Shu Qi.- Arts of War: The Biographies of Sun Wu and Sun Bin.- Imperial Assassin: The Biography of Jing Ke.- How Others Live: The Customs of the Xiongnu. THOMAS R. MARTIN (Ph.D., Harvard University) is Jeremiah O'Connor Professor in Classics at the College of the Holy Cross, UK. He is the author of Sovereignty and Coinage in Classical Greece (1985) and Ancient Greece (2000), and he is a co-author of The Making of the West: Peoples and Cultures (2009). He is also one of the originators of Perseus: Interactive Sources and Studies on Ancient Greece (www.perseus.tufts.edu).